The original TOSHIBA CTRC2US18 Remote Control is in-stock and ships within 24 hours. The original TOSHIBA CTRC2US18 Remote Control carries a 60-Days Warranty. For Toshiba Chromcast bulit-in tv. The remote works perfectly. No programming necessary. by Rory on March 16, 2019.
by Leonardo on March 10, 2019. 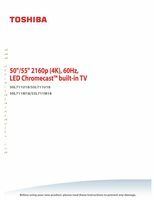 Works great for my Toshiba Chromecast 55"
by peter on January 10, 2019.
by Adam on July 14, 2018.